The Seventh-day Adventist Church is a mainstream Protestant church with approximately 20 million members worldwide which includes more than 1.2 million members in North America. The Seventh-day Adventist Church seeks to enhance quality of life for people everywhere and to let people know that Jesus is coming again soon. Meeting Requests Thank you for your interest in the North American Division of Seventh-day Adventist Church's building for your event! To submit your request, please fill out the requested fields on the following link: https://hr.naddocs.org/Forms/Meeting-Request. Make sure to fill out every section and submit. You will receive a confirmation of receipt. This compilation of Official Guidelines comes in response to frequently asked questions - "What does the church say about? ..." These inquiries come from among our own believers, church pastors and the general public or media. The Seventh-day Adventist Church is organized with a representative form of church government. This means authority in the Church comes from the membership of local churches. Executive responsibility is given to representative bodies and officers to govern the Church. 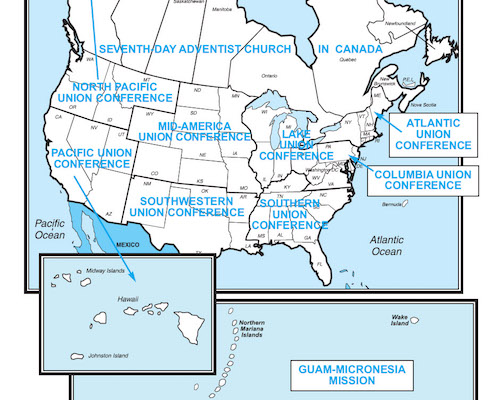 Learn more about the North American Division by looking at our map of territories, including Bermuda, Canada, Guam/Micronesia and the United States.